2. J. Sumathi, V. Sathiesh Kumar and Nilesh J. Vasa, "Investigation of minerals using laser induced breakdown spectroscopy technique under high pressure conditions", Conference on Laser Ablation (COLA 2017), Marseille, France, between 3-8th September 2017. 1. J. Sumathi and V. Sathiesh Kumar, "Investigation of a ns-pulsed laser ablation rate on a Cu target at 1 atm", NLS-25, 20-23rd December 2016, KIIT University, Bhuvaneshwar. 4. Thangaraja M, Sathiesh Kumar V and Nilesh J. Vasa, "Investigation of optimal parameters for remote soil testing using LIBS", Conference on Laser Ablation (COLA 2017), Marseille, France between 3-8th September 2017. 3. 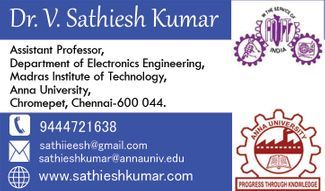 M. Thangaraja, "Industrial automation using wireless mesh networks", Applied Mechanics and Materials, Vol. 367, pp. 417-421, 2013. 2. M. Thangaraja, "FPGA based WiFi, WiMax Router (WWR) for Multihop Networks", Asia Pacific Symposium on Applied Electromagnetics and Mechanics, pp. 384-389, 2012. 1. M. Thangaraja, "Interoperability of Wireless Mesh and WiFi Network using FPGA for 4G solution", International Conference on Recent Trends in Information Technology (ICRTIT 2011), 2011. 2. Anubha Pearline S, Hemalatha M, "Face recognition under varying blur in an unconstrained environment", IJRET, Vol. 5, Issue. 4, April 2016. 1. Anubha Pearline S, Hemalatha M, "Face recognition under varying blur, illumination and expression in an unconstrained environment", CIC 2016. 1. K. Veerappan, V. Sathiesh Kumar and Nilesh J. Vasa, "Identification of nutrients in plant materials using laser induced breakdown spectroscopy technique", Conference on Laser Ablation (COLA 2017), Marseille, France, 3-8th September 2017. 6. S RUBIN BOSE, P. NAVEEN HONEST RAJ, J.NIXON MANUEL "Embodied Conversational Agents Based Home Automation Using FPGA", International Journal on Recent Researchers in Science, Engineering & Technology, Volume-3 and Issue No-4, April-2015, ISSN (print): 2347-6729, ISSN (online): 2348-3105. 5. S RUBIN BOSE, A.ABINAYA CHRISTY, "Wireless Cardiac Monitoring System", National Conference on Innovative Trends in Engineering and Technology, NCITET-2016, April 02, 2016. 4. S RUBIN BOSE, S. SUBASH CHANDRA BHARATHI, "Implementation of Device Driver for NOR Flash", ICETEC-15. 3. S RUBIN BOSE,P. NAVEEN HONEST RAJ, J.NIXON MANUEL, "Embodied Conversational Agents Based Home Automation using FPGA", ICONSTEM 2015. 2. S RUBIN BOSE, S. SUBASH CHANDRA BHARATHI, "ARM Based Recyclable Waste Materials Segregation", International Conference on Electrical, Communication and Computing ICECC-2014, March 13, 14, 2014. 1. S RUBIN BOSE, S. SARAVANAN, "Design of low power high performance Multiplier using a Shannon Based adder cell for efficient Neural Network Implementation". (ICEESPEEE-09), APRIL 16, 17, 2009.